A 52 y/o male with a history of HTN presents to the ED complaining of palpitations on and off x 2 days. He reports he has been drinking a lot of caffeinated beverages. He now feels palpitations which begin abruptly, last 1-2 hours, then resolve. They have been recurring over the last couple of days. His EKG is below. Non-conducted PAC’s are benign and usually require no treatment. The main point is to recognize this is NOT 2nd degree AV block and the patient does not need a pacemaker. The EKG demonstrates P waves followed by QRS complexes. However, the rhythm is not completely regular. Beats 3 and 10 come early. These are premature atrial contractions (AKA PAC’s). We also see pauses on the EKG (after beats 5 and 7). At the beginning of those pauses, we see P waves buried in the preceding T waves. (Look at the notching in those T waves and compare them to the other T waves in the rhythm strip.) These P waves come earlier than expected and therefore also represent PAC’s. However, note that there is no QRS complex following these P waves. This happens because the P wave comes so early, at a time when the ventricles are still refractory. So, they do not conduct. These are called non-conducted PAC’s. Non-conducted PAC’s may appear like a 2o AV block. You see P waves with no QRS complex following them and a pause on the rhythm strip. This is usually typical of 2nd degree AV block. However, to call something 2nd degree AV block, the P waves must come on time (i.e. the P-P interval must be regular). On our EKG, the P waves come early (i.e. the P-P interval is irregular). 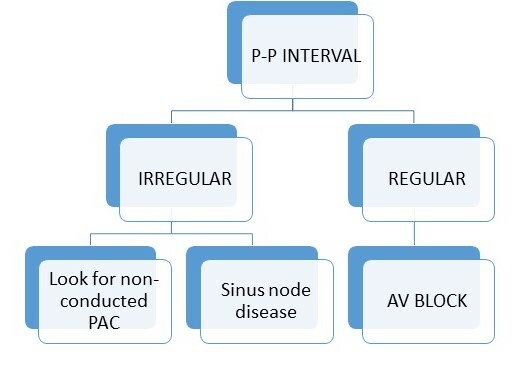 So, the reason the ventricles do not conduct is NOT because there is a block in the AV node. It is because the P wave came too early and the ventricles are not ready to contract yet. So, this patient does not have AV node disease and does not need a pacemaker. Non-conducted PAC’s are a very common cause of pauses on EKG. Whenever you encounter a pause, look back at the preceding T wave before the pause to see if there is a P wave buried in there.